How one chooses to deal with bad news, tells a lot about the integrity of people running the organization. As a credit card expert witness RK Hammer can assist with the litigation. “Running and hiding” in the hope it will all just go away is never good PR strategy. We’ve seen some business owners and politicians try to hide the bad news, delay the updates, to their ruination. Coming clean with bad news is important and necessary. To hide from the truth brings out damage to your cause, often greater than the initial crisis itself. The crisis won’t get you; the lying about it will. Ask those former politicians who used to be important. Their example shows us what not to do. First, face the facts, damaging as they may seem. Then, ask yourself what is the worst that could possibly happen as a result of the crisis. Next, probe for corrective measures which could make a repeat of the problem far less possible. Confide in trusted advisors such as credit card expert witness RK Hammer who may have insight in how to get out in front with responsible damage control. If someone gives you good – but painful – advice, take it. Then, be prepared to explain all of the above to the public and what you are doing about it now, and how the problem arose in the first place. Give them a timetable for new updates, and who in the organization the press and others may contact for news on the matter going forward. There is no magic bullet for dealing with very bad news, except to look at recent history as to how not to do so. The news cycle rumor mill will be chasing you for a full disclosure. So, give it all to them in advance – thus, give them nowhere to go for further bad news. Reread this paragraph again, it’s that important. Many companies and politicians come out of these situations even stronger for their forthright truthfulness. Others, as we have sadly witnesses have stonewalled to this very day with things they should have divulged months or even years earlier. Whatever you do in damage control mode, don’t stonewall, run or hide from the facts, hoping against hope that the people will become numb to the issue and just go away. Never works like that, though. Never will. Half-truths are half-false. You can’t just rope yourself off from the press to avoid having to answer tough questions as you stroll down the street. You end up looking foolish and inept and insecure, and it really doesn’t accomplish anything meaningful. Incompetence, insecurity, and lack of integrity usually becomes well known to all soon enough. As Ali-Foreman showed us, the phrase “Rope a Dope” comes to mind. Everyone goes through crises during their careers – some minor and fleeting, and others life changing and forever forging your character, such as it is. If you look yourself in the mirror in the heat of the crisis as it unfolds and still choose to delay, delay, delay with getting the true facts out because you may be too insecure within yourself to do otherwise, well then you may end up like those other sad sacks who chose the same disingenuous way of dealing with bad news. Continuously hiding the truth. The real battles for those who do this will have only just begun. Don’t do it. Learn from those weak others who chose the easy way out with what not to do. Quick! Those ringing sounds you may hear is FOX News on line 1 and CNN on line 2, both calling for an immediate and full comment. Better take the calls. Advisor R.K. Hammer has been a payment cards analyst for decades while reporting on the performance and characteristics of all segments of the issuing business . One other emerging category which has received far less scrutiny, though, is what we term “Near-Prime.” “Other than subprime issuers, everyone of course would much prefer a portfolio of Prime’s and Super Prime’s, but there are only so many of those to go around,” notes Bob Hammer, Founder and CEO at R.K. Hammer. What Are “Near-Prime” Accounts, and What Does it Mean for the New Payment Cards Applicant and Card Issuers? Near-Prime new card account applicants live on the border of becoming Prime, they are just not yet there. FICO scores in the range of 650 – 699 in our models are below the threshold necessary to be considered Prime by many; though, they are also deemed above the quality of subprime accounts (< 650 FICO scores). This definition will of course vary by organization. Wikipedia lists it under “SubPrime lending”. This can also change positively over time; however, for those whose account behavior performance improves as the account seasons, becoming more stable, predictable and thus more creditworthy. We calculate that roughly 12.2% of the adult population in the U.S. have FICO scores between 650 and 700. That equates to over 30,000,000 potential prospects in this bandwidth alone. Compare your existing card account market share with this population opportunity, and perhaps you can see lots of possibilities, whatever your regional or national marketing reach may be. At initial card issuance, Prime card applicants can currently expect around 14.0% APR’s; that rises to 17.5% for Near-Prime, and 20%+ for subprime. Annual fees and other fees also vary widely between the varying quality segments. Savvy issuers have been examining this lesser known category for their growth and “graduation” potential. Every next million accounts of quality is harder and harder to find, so it seems clear that to expand one’s marketing push to include these borderline applicants can make sense. They must be properly priced and managed, though. In addition, an important part of the account maintenance for Near-Prime accounts is to have a well-defined “status graduation” program in place; an “educational marketing” strategy, as payment cards analyst R.K. Hammer terms it. The more informed consumers are, the strategy goes, the better the overall portfolio risk profile will ultimately become. Based upon usage and repayment behavior many issuers follow the progress of these accounts for potential to be graduated to Prime status, with higher resulting credit lines and lower resulting APR’s. Once their monthly FICO’s have crossed the threshold for Prime, however any given issuer may define that term internally, they will naturally begin to receive prime account offers from other issuers, too. Not to graduate these accounts then to the higher level of account status and at better terms creates a negative self-fulfilling prophesy; they will simply and inevitably attrite to another issuer who gives them a better value proposition that they now deserve. As a payment cards analyst it is important to note that there is no one generally accepted risk management definition of Near-Prime accounts, nor is there any commonly accepted new card applicant cut-off score, below which the card application would otherwise be declined. Most card lenders use varying version updates of FICO scores, plus data reported to the three credit bureaus, and accompanied by application information scores and other available internal information used to assess payment cards applicant risk. Importantly, one can reduce account risk when going deeper into the FICO bandwidths: lower initial lines of credit, less cash availability in the first year or two, adjusting the APR’s upward to reflect taking more risk, and using what we term an “educational marketing strategy.” The more informed about wise credit use a new account holder becomes, the better performing they will be. You don’t alter new applicant cutoff scores lightly. As with anything new in the business model, you test it. Place these approved accounts in a separate agent grouping and follow the characteristics and performance of these accounts; in terms of initial activation, ongoing active rates, graduation rates, plus usage and repayment behavior, and ROA/ROE. Over time, you will see how the group behaves compared to your portfolio overall. Then you can make a judgement about the appropriateness of the test, and whether to expand it use in your marketing efforts. What’s the best definition of Near-Prime? “Your data supported by your definition” is the short answer, notes R.K. Hammer. The takeaway is this: we are all looking for new quality card accounts – however one defines quality – and we believe that the payment cards analyst segment which deserves a closer look is Near-Prime. Properly priced and closely managed, these accounts have opportunities to satisfy consumers who might otherwise might be declined, and then be given the chance to rise to Prime status (and better terms) if their usage and repayment performance is deemed satisfactory over time. 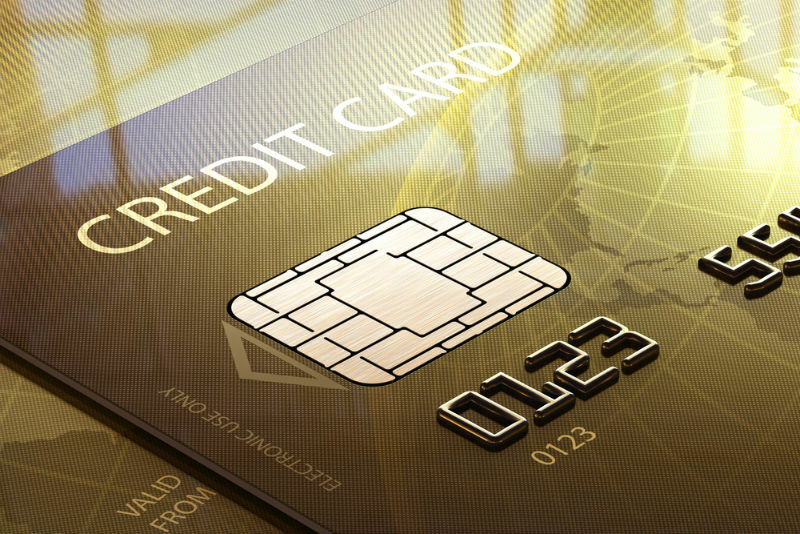 Hammer reports that some card organizations graduate these accounts as soon as the FICO snapshot hits a preset threshold target, while others wait to see if that improved performance is proven reliable over several months as a trend not just a snapshot before offering the improved product and pricing, raising the card account to Prime status. Either way, it becomes a win/win for the consumer and the lender to spend management time better understanding and growing a file of Near-Prime accounts, and upgrading when possible. The foregoing describes one approach; I’d invite the readers to suggest others, as well. It took over twenty-five years and still counting to create a bank card consulting practice with clients from over 50 countries on six continents. Maybe you would like to do the same. Some of those clients took years to cultivate and develop earlier, though, as is often the case. Business decisions with bank card clients abroad tend to be based on relationships, rarely first meetings, and good long term relationships simply take time. Prepare yourself to invest a lot more time burn cost abroad than perhaps you do in the U.S. It’s an investment in time and energy that I always welcome. Bank Card Consulting client locations? In Asia/Pacific: Hong Kong, Australia, New Zealand, Philippines, Malaysia, China, Taiwan, Thailand, India, Indonesia, Bali, and Singapore. In Europe: United Kingdom, Ireland, Germany, France, Portugal, and Spain. In the Caribbean: Antigua, Puerto Rico, and the Dominican Republic. In Latin America: Mexico, Columbia, Brazil, Ecuador, Chile, Costa Rica, Paraguay, Uruguay, Honduras, and Argentina. In North America: All the top banks in the U.S. and Canada. 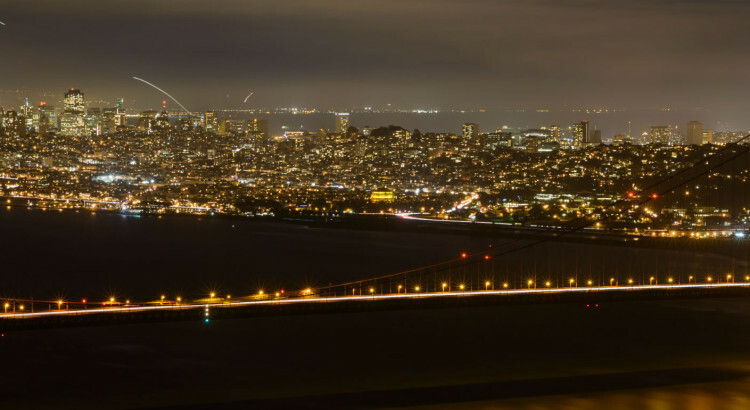 Here are ten of the important lessons learned from all those regions of the world, and what it may mean for your enterprise international expansion hopes, if you are inclined to do so. First, get an experienced local host in each area we would visit for the first time or in which we would attempt to get clients. One never has to do everything for yourself. Why would you, when someone there can show you the local ropes and customs? Break a custom or known rule in a new culture and you have probably just equally broken your chances at getting any new business there. Second, we always had a real curiosity about other lands, other people, other customs and other cultures. If you aren’t truly interested in learning about other cultures and places, you may not like expanding abroad. Fourth, as communications with bank card clients and friends now transmit at the speed of light (or thought, as you wish), can be in many countries in the same day. Even half way around the world is easy to accommodate – just as long as you are prepared to get up early or stay up late, with all the time zones between you and the recipient of your scheduled call. With e-mail and text, it’s even easier. The back and forth is rarely a problem. Thanks again, to high tech. LinkedIn included. Fifth, if you have a true curiosity about other cultures, you will most likely really enjoy the experience. We have very fond memories of being with new friends from across the oceans. If one doesn’t really care or have such curiosity, stay home, as this may not be for you. The language barrier? Very rarely a problem. 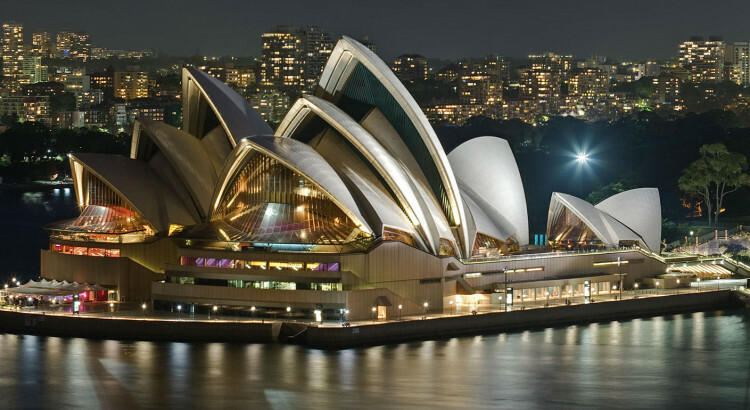 English is spoken virtually everywhere, and we found most international clients like to use it. Sixth, fully prepare your itinerary, and pack accordingly. We once spent two weeks going 24,000 miles all around the globe visiting many bank card consulting clients and countries in the process, and only had to have one carry on to do so. Travel experience will come back to help – or haunt – you. Travel can be gruesome these days. Most of your fellow airline travelers are like that; very interesting people who love sharing what they have learned or know about the location you may be both going to. That has been my experience in dozens of business trips around the globe. If you enjoy listening to other points of view, you may just do well internationally. Trouble is, we sometimes talk when we should be listening. Seventh, Set your watch and become mentally and physically prepared to be on my client’s time zone the moment we step foot on the outbound plane, long before we land in another far away country. Sleep along the way if you can. Eighth, devote much more to time doing pre-trip research than on the trip itself. Who are the players? What are their successes? What are there sustainable competitive advantages? What are their possible organizational needs? What seem to be their guiding values? Who among the ranks are the future rising stars? How do they differentiate themselves from their competition? Are those solutions already in our wheelhouse? Ninth, be prepared to experience meals like you’ve never seen or tasted before. Delicacies for the palate at which you might first be a little surprised. Enjoy trying new things, so dining out with international clients is a real treat. Tenth, taking a ten or eleven hour plane trip is not for everyone. But oh my, when you arrive you can be in a very different and very fascinating world. New friends, new cultures, new ways of doing bank card consulting. How refreshing it can be, if you are interested. It’s one way I think R.K. Hammer has such an international presence. We work hard to earn that reputation every day all over again with our bank card consulting clients, regardless of the continent or the country involved. There is more, so much more than one could share, but perhaps this will at least get you thinking, get you started. Also, review the International travel “Check List”. Good luck, my friends! Got to run, folks, to LAX to catch another plane. It’s been “banking without borders” for over 26 years now at R.K. Hammer. I wouldn’t have it any other way, and thank my international friends for the experiences of a lifetime. Four years ago we undertook a payment business analysis study of what the possible costs of new regulation and legislation might be for Debit card Interchange swipe fees (2011 Durbin Amendment to Dodd-Frank) and the 2009 CARD Act. 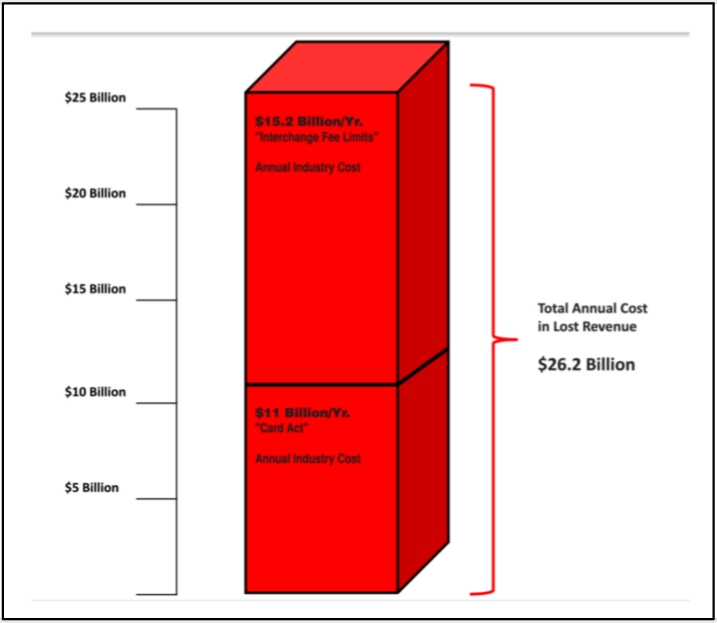 As the chart below shows, our estimate at the time was $26.2 Billion every year in lost revenue for the card industry. That number still seems about right. Who will pay for all this? Consumers…in the form of higher fees. Don’t get us wrong, we believe that much of what was intended was useful, that card fees needed better more transparent disclosure, what we often coined at the time “The Educational Card Act.” And in the years since enactment, we still believe much of what was intended produced favorable and important consumer education. There have also been unintended consequences of these regulations and legislation to the payment business. The jury is still out as to whether or not new card fees will fully offset the annual cost of these regulations – but there already have been and will continue to be new consumer card fees, an financial institutions seek ways to offset the cost of new regulation and legislation. Some other estimates of new/increased card fees so far are around one-third of what the lost revenue is each year, or $8.6 Billion per year. That figure will rise in the future since most issuers are going through extensive due diligence on what services are being provide free of charge, and what could be assessed if they chose to do so. We recognize that some issuers use cards as a cross sell to other important products in their suite of customer services, and therefore may not elect to raise or charge new fees. Others most certainly will as they treat cards not as a loss-leader but as free-standing profit center. In fact the card business is often the most profitable product at many organizations, in terms of ROA, ROE, and IRR, if not EBIDTA. What happens when our credit card portfolio services provide only the highest card member satisfaction? Nothing but good things. For example, when we have better service levels and remember we are in the “Yes We Can” business, our card members become and remain more loyal to our enterprises. Back to surveys. We once sent out a card member feedback survey, randomly sampled from our portfolio, and got a 45% response rate. We sent those surveys to a subset of card members who had any direct communication with us in the past 30 days (customer service, collections, fraud, etc. ); to make sure we were doing right by them, treating them with respect, and giving the best credit card portfolio services level possible. What we learned from their responses in this survey and other sentiment testing tools was then put into action in our business model going forward. Nice results, so we thought at the time. The second example of customer satisfaction testing comes to us from another industry with and even better feedback response rate. There is a local grocery chain we routinely shop at. Their parent company asks every customer at check out to complete an online survey, with the simple instructions how to do so on every sales slip. Next, every time you check out, all of the checkers at this store personally ask their customers to complete the online form telling them how they are doing, and circles the simple store feedback process on your sales slip. In addition there is a drawing from among the customers who complete the 5-minute online survey, and the monthly winner receives a cash reward. So, they are doing at least three things to call you to action. Pretty savvy. The results: last month this particular store received positive survey feedback from 90% of their customers. 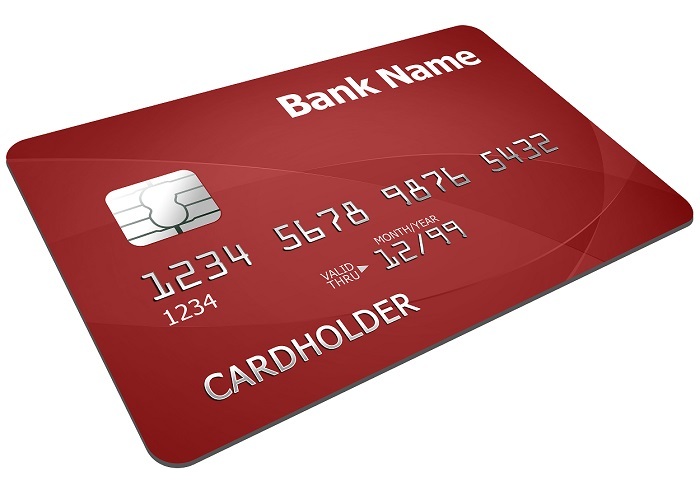 The lesson for us in the credit card portfolio services business is very important. First, they actively seek the customer’s feedback, not just buried in the fine print on their transaction slips. Next, they take action on what the customer is saying (read, adjust their business model as needed, in the customer’s eyes). Then, they reward the customer with only the highest service levels, in every department. Moreover, they do all this every day with every customer. That’s a true “commitment to excellence” (importantly, defined by their customers). Contrast that with our experience at other local markets, who all also have sales slip information for online surveys. Not one other store in our area actively seeks the shopper’s feedback. That, as opposed to the local market described above with stellar results; never once have their checkers failed to ask us to complete the survey. Never once. It’s the polar opposite of every other market in town. No surprise that this enterprise is always #1 in their market area, and in their loyal customers’ eyes. So, if you think your card member feedback produces impressive results, good for you. Your P/L earnings probably reflect that. For a suggestion on how to improve no matter how high a result you may presently get: I would put two of the newest MBA ”fast track” employees on the case and have them develop a higher responding online card member feedback tool we can use to see how we are doing. I’d give them (and their assigned mentor in the company) the authority to talk to anyone in any department of the company whose works touches card members directly, and give them 60 days to come up with a better feedback plan of action for us to pursue, presented to the Managing Committee, with weekly progress reports during the two month project to their mentor. This is a pretty fair new employee training tool, as well, to familiarize them with the various operations in our card company. See of it might produce better results for you, too. Any other ideas out there? R.K. Hammer is a world-renowned bank card advisory services firm with a payment and credit card industry specialization, our research and that of many others have shown an escalating CPA curve for getting new credit card accounts. Why is that? Well, for one the solicitation response rates have plummeted in the last ten years. Ten years ago we saw an average solicitation response rate of 0.66%, less than one in a hundred, depending on application flow channel. Today that average number is about 0.22%, a third of what it was a decade before. You’ve got to send out a lot more offers through all channels just to stay even with your new booked account results of the past. Next, quality costs. After the 2008-2010 recession debacle, all card issuers raised new applicant cutoff scores. The result? Obviously fewer accounts are approved. So, as consumers grew cautious, and additionally fewer approvals as issuers raised underwriting standards. All this raised costs per new booked card accounts. Then again, new rules and regulations before and after the recession have caused costs to rise, as issuers dealt with compliance issues and loan loss provisions. The necessary focus on card quality produced additional cautionary measures in most issuers risk management protocols. Application fraud, as well, has not gone away. Perhaps not in CPA calculations directly, but it falls to the bottom line just as seriously as loan losses. If anything, new credit card applicant fraud has become as sophisticated as our own technology and decision science tools. It is and always been a “cat and mouse” game between the card issuers and the fraudsters. That is even more expensive to the banks than low solicitation response rates. Like credit losses, fraud losses come right off the P/L results. What is the CPA cost to get a qualifying new card account? Our bank card advisory services research shows that ten years ago it was at $95 on average. Today that average (of all channels and product types) has risen to $145. The CPA annual rate of ascent has been at about a 45 degree climb year over year until only recently, topping out. Can you improve that trend? Yes, but it takes work. Pinpoint solicitation target accuracy is the new norm. Shotgun approaches are out. Moreover, offers must meet the needs of each particular segment, down to the applicant level. If a given value proposition bores me or otherwise does not meet my needs, you’ll be in the click delete trash can – real or electronic – in less than 15 seconds. Lines must be adapted to the present day situation. An otherwise great product from a world class issuer will fall on deaf ears if the line of credit offered is simply not where it needs to be, in the applicant’s eyes. What else can be done? Take a look at your weekly number trends for cardholder sentiment or other customer satisfaction tool data. Oh, you don’t have that weekly? There’s an opportunity here. What do your new applicant focus groups tell you? Oh, you don’t have those either? I see a problem that ought to be addressed. Looking at all distribution channels for new card accounts, the “range” of CPA the last time we looked was between $20 to over $300, based upon channel. How does that compare to your CPA data results? You would not expect that a branch sourced application (with other products they also buy from you) to have the same CPA as a customer with whom you have no existing relationship. In addition the CPA for agent bank applications, merchant take-one’s, online applications, and portfolio acquisitions will be vastly different from one another. An agent bank program reward for new accounts is often $40 – $50 in the first year per active account, plus an ongoing rev-share of so many basis points on net cardholder sales (50 bps to 100 bps). On the other hand, a card portfolio acquisition with existing seasoned balances and acceptable credit quality would be worth much more in terms of purchase CPA. Most of us have a blended population of new accounts from lots of different channels. The average of all might be $145 but the range by channel will be very wide. Our recent research at Card Knowledge Factory® shows that the prior escalating trend in CPA for new card accounts is leveling off as it nears its theoretical maximum threshold. We do not expect that past 45 degree annual ascent rate to continue, but nevertheless will still remain stubbornly high near its present level for the foreseeable future. There is another meaningful metric to consider: Net Present Value of those newly acquired card accounts. How does the present rate for CPA ($145) compare to the Net Present Value of those new card accounts? How does $1,275 average NPV sound? That is the latest bank card advisory services calculation at our Card Knowledge Factory® research and analysis division. Therefore, there is a lot of room in the card pricing spread we’ve found for issuers to pay higher rewards for obtaining new accounts. Take your own data and measure the spread between your CPA and your NPV. I suspect that your results may be similar. We’ve led the due diligence on 151 credit card portfolio valuation, sales and purchases, with our projects producing an estimated near $1B in pre-tax client profits. Deciding to sell your credit card portfolio is never an easy decision to reach, especially considering the very reason the sale would generate a profit is the strong current and future earnings from the portfolio. When you divest, you give up that future earnings stream. Still, when an organization needs an immediate boost to earnings or capital, or both, the card portfolio becomes an even stronger contributor to shareholder value through a credit card portfolio sale, partial or total. A net/present value estimate and transaction expectations are prepared. A book of prospective bidders is built. The Offering Memorandum is constructed and distributed to those known portfolio bidders most likely to be interested in the portfolio. Discussions are held with potential bidders clarifying the portfolio characteristics. Due diligence is coordinated, and letters of intent and contracts negotiated. The foregoing can usually be accomplished in 45-60 days, although shorter time frames can be accommodated.